Porcelain insulators (bell type) were first created in 1849 by Werner von Seimens. Porcelain Insulators was originally used for insulation of telephone lines. Since then, porcelain insulators have evolved and has found vast usage especially in the transmission lines system acting as insulators. The second purpose is very important to operation since without some form of insulating material, electrical circuit cannot operate. To be able to isolate conductors, insulators must be made of materials that offer a great deal of resistance to the flow of electricity. Porcelain is one of the most highly used insulator type along with glass and other synthetic materials. Porcelain is a multiphase ceramic material that is obtained by heating aluminum silicates until a mullite phase is formed. Mullite us porous, its surface must be glazed with a high melting point glass to render its smooth and impervious for use in overhead line insulators. 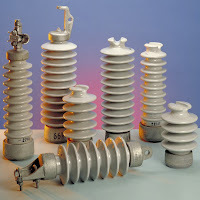 Porcelain insulators, like any insulators come in a variety of different shapes and sizes, to accommodate the insulator rating as well as its usage. Insulators are rated in terms of its electrical and mechanical handling capabilities. As for its usage, there are three types of insulators typically found on transmission lines. 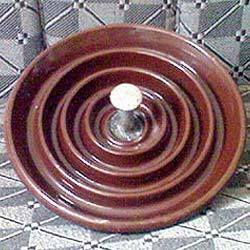 They are pin insulators, post insulators, and disc insulators. Are generally designed for use on lower range of transmission voltages. Pin insulators are mounted on poles or cross arms using an insulator pin, made up of metal or wood. Pin insulators are always designed to support a conductor upright or vertical on top. Post insulators can be mounted vertically on the tops of poles or cross arms or horizontally on the side of the pole. 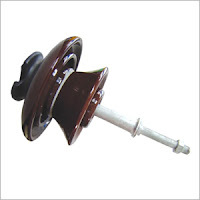 Disc insulators can be connected together in strings to accommodate the requirements of any transmission voltage. They are usually bell shaped, and have mechanisms on the top and bottom for connecting.